The aerial view over the beaches of Grand Turk. The ride’s short and it isn’t inexpensive, but this excursion combines the excitement of riding in a helicopter with the excellent aerial vistas of Grand Turk. There really is a lot to see: the intricate reefs, sand patterns in the ocean, marine life, salinas and more. A Eurocopter EC120 tour helicopter over Grand Turk. A helicopter tour is a brief yet exciting thing to do whilst on Grand Turk. There are many fascinating sights to spot from above, including cruise ships, the barrier reefs and beaches, the Grand Turk Lighthouse, the old salt ponds, the abandoned Grand Turk's U.S. Navy NAVFAC 104 Base, and larger sea life such as stingrays, sharks and turtles. During the winter whale season, spotting a pod of majestic humpback whales may be another highlight of the excursion. The Turks and Caicos Islands sit on elevated subterranean plateaus that rise abruptly off the Atlantic Ocean floor. For much of the perimeter of this plateau, the transition from shallow water to deep is quite sheer. The contrast of the blue of the depths, the turquoise of the sandy shallows, and the yellows and greens of the barrier reef is unforgettable. When there’s an ocean swell, the slow and fascinating action of waves breaking over the reefs is also amazing. This is especially apparent at North Reef, near the lighthouse. Beautiful today, the treacherous shallows here claimed many ships. There are several different tour packages to choose from, however, common routes head out to Gibbs Cay and then loop the entire island of Grand Turk. Tours are typically about 12-15 minutes in duration, narrated, and complimentary transport to and from the helipad is included. Small helicopters are used, so a maximum of four passengers can be accommodated. Headsets allow for communication between the pilot and passengers. The helipad is located a short distance from the Grand Turk Cruise Center, and a shuttle is provided for visitors. If you are not a cruise guest, you are advised to contact the company in advance to arrange a tour. 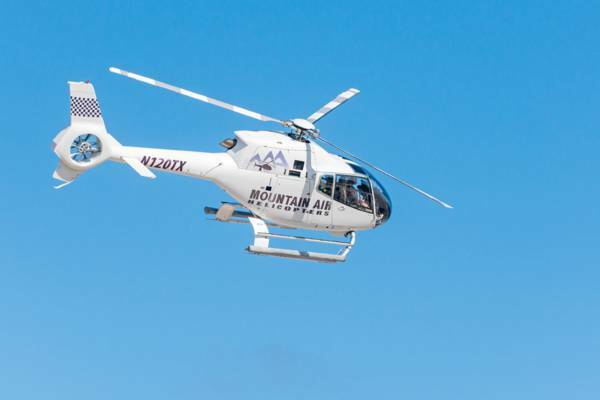 Mountain Air offers helicopter tours over Grand Turk and the nearby uninhabited cays. See the cruise ships, beaches, crystal turquoise ocean, the Grand Turk Lighthouse and more. Free transport to and from the Cruise Center.